Nuking My House On Line (You Can, Too) : Krulwich Wonders... Andrew Wellerstein is a mad bomber — but a careful, data-driven, history-minded mad bomber. The science historian's latest project gives you the fascinating, terrifying power to detonate. I blew up my neighborhood today, courtesy of Alex Wellerstein, science historian. Wellerstein works at the American Institute of Physics in College Park, Maryland. After hours, he is a mad bomber — but a careful, data-driven, history-minded mad bomber. His newest creation, which I found on his blog, is called NUKEMAP. It allows you to choose a city, any city (I chose the Upper West Side of Manhattan, where I live), an atomic or hydrogen bomb of any size (whatever kiloton level you like, or you can pick from a list of historically specific bombs). On the screen, you'll find a Google map of your chosen neighborhood with your bomb, represented by a little bomb-shaped icon, ticking at its center. You can then take your cursor, move the bomb to the exact location you want (when you move it, it casts a dangerous looking x on the "ground" below). When you reach your designated ground zero (I chose my apartment building), you are ready for the next step. The explosion creates a series of concentric circles, color-coded to show the zone where everything is incinerated, the space where most things get emulsified or crushed, the space where radiation is lethal, the space where people are poisoned by radiation, the space where they are badly burned — concentric circles of destruction. The effects are chilling and fascinating. When I tried out some of the more powerful bombs, I was stunned by their destructive power. I had no idea. Playing with these bombs teaches you how big they've gotten. Drop the "Little Boy" that hit Hiroshima on any neighborhood, the destruction is grim but local, a couple of miles across. Take a 100-megaton bomb from the Russian arsenal, called the "Tsar," and it will ignite fires across a 48-mile stretch, an extraordinary reach, which makes me wonder, why? No military target is that large. I suspect the designers of these bombs were seeking wholesale destruction, that their urge here was beyond shock and awe, more like genocidal. Wellerstein's site does not include terrorist "dirty" bombs. He has developed scenarios for those weapons, but in an interview with the Toronto Sun, he calls them "a different animal," since their range is so dependent on terrain and wind patterns. He also cautions that his radiation zones should be considered only rough approximations when you drop bombs in your home town. 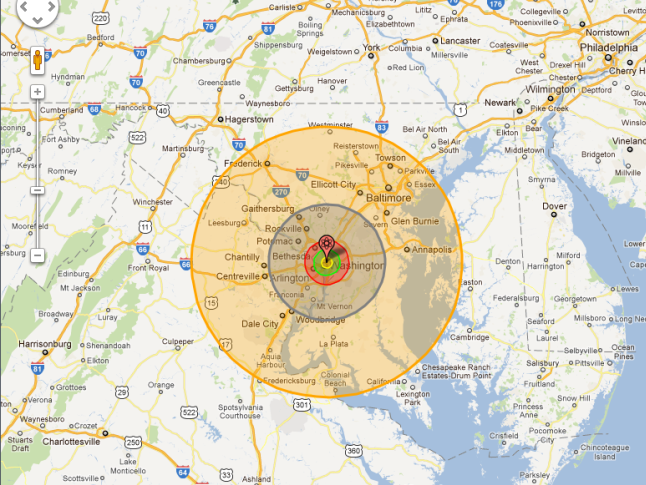 Since NUKEMAP came online early in February, thousands of people have blown stuff up. So far there have been more than 20,000 "detonations," but Wellerstein points out that at the height of the Cold War, 20,000 bombs equaled roughly a third of the world's total nuclear arsenal. Since 1966, the peak, the pile has gotten much smaller. There were roughly 8,000 active nuclear warheads in the world in 2010, and maybe another 22,000 in storage. And that's not counting whatever is going on in Iran.